Millions gather for war. Who will be left standing when the battle leaves the Tribulation Force in the brink of the end of time and the Glorious Appearing? Book 11 in the Left Behind end-times thriller series, by Time LaHaye and Jerry B. Jenkins. The cosmic battle of the ages. 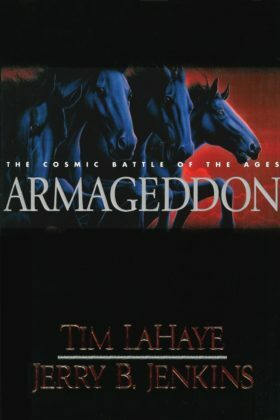 The scattered Tribulation Force is drawn inexorably toward the Middle East, as are all the armies of the world, when history homes in on the battle of the ages. During the last year of the Great Tribulation, safe houses are no longer safe, friends and loved ones must commemorate two lives in one memorial service, and the cast of characters dramatically changes. By the time of the war of the great day of God the Almighty, homes have been uprooted, new alliances forged, and the globe has become a powder keg of danger. Except those already in Petra, everyone has been forced to relocate as Antichrist ratchets up the ante in the world’s most treacherous game. New love is sparked, recent love is formalized, and old love is aggrieved while millions gather for war. Who will be left standing when the battle leaves the Tribulation Force in the brink of the end of time and the Glorious Appearing? Book 11 in the Left Behind end-times thriller series, by Time LaHaye and Jerry B. Jenkins.